Traditionally computer systems use client server model. This is more of a centralized approach; server sits there and responds to clients requests. If one server is not enough for computation/analysis, a "hierarchical" organization of servers model is adopted in datacenter and cloud computing. One node becomes the master, other nodes act as workers. This is called the master-worker model. This simple model make sense if you have an infrastructure. Centralized control architecture is simple, so you can keep the coordination simple and efficient. Peer-to-peer model is on the other end of the spectrum: it calls for a fully decentralized system model. There is no distinguished master. Each node acts as both server and client, each node is a peer. This model does not require stable infrastructure and it can self-organize with what is presently available. As such, they are great for circumventing laws, bans, and censorship. 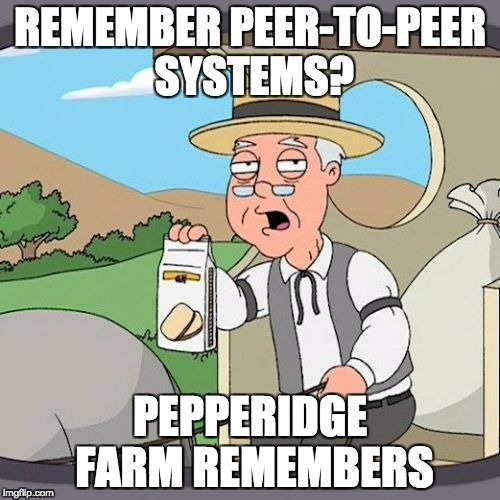 In 2000s, peer-to-peer systems were all the craze. Peer-to-peer music sharing applications, Napster, Gnutella, and Kazaa, were very popular and successful. There were systems called CAN, Chord, Pastry, and Tapestry. Bittorrent, peer-to-peer communication protocol was also very popular: "In November 2004, BitTorrent was responsible for 25% of all Internet traffic." 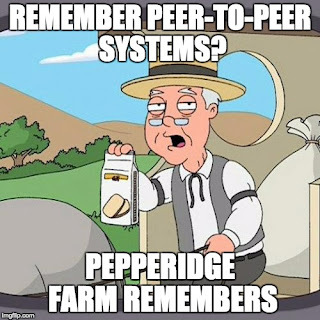 Then, peer-to-peer systems disappeared from the scene in the next 5 years or so. The peer-to-peer architecture got abolished, but the best ideas from those work found their way to traditional datacenter computing. Consistent hashing got adopted for distributed key-value stores. Bittorrent saw some uses in datacenter application-layer networking. Today, the pendulum is swinging back again to peer-to-peer systems for decentralized attestation with blockchain and ipfs applications. As a distributed systems professor, I should be exuberant like everybody else, but I am cautious. (As I wrote in 2014, distributed is not necessarily more scalable than centralized). The centralized coordination architectures (today's cloud computing and datacenter architectures) have a strong attraction point: they are simple and efficient to coordinate. Even then we mess up building those systems. So we don't stand much chance in building, scaling, and maintaining fully-decentralized systems, let alone leveraging on them as scaffolding to build/control/coordinate more sophisticated and scalable applications. So, most likely, this will play out similar to the peer-to-peer systems of 2000. The blockchain architectures will fade away, but the best ideas of blockchain systems will be adopted for adding attestation, authentication and smart-contracts for cloud computing and datacenter applications. Hopefully those ideas can be used to fix the problems with social networks and make them used for enabling collaboration to make/build things, where individual effort/labor/contribution can be tracked and rewarded appropriately.